To assist with your lifting requirements, we stock a wide range of lifting chain slings and associated components. Chain slings are widely used in lifting and rigging operations and we stock 1, 2 and 4 leg configurations to suit your requirements. 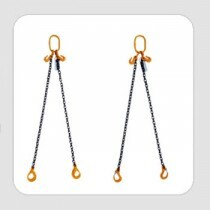 Our chain slings are made of high tensile materials. The pre-assembled chain slings utilise a Herc-Alloy 800TM chain. Some of the advantages include reliability, durability, flexibility and adaptability. This is ideal for lifting heavy items on construction and manufacturing sites. All chains are adjustable and can be manufactured in various widths (6 – 13 millimetres) and lengths (1 – 6 metres). 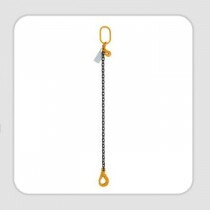 Our chains suit traditional clevis self-lock and clevis safety-latch hooks. We also stock a selection of components including chains, oblong links, master links, hooks, multi links and much more. Choosing the right lifting chain sling for your operations requires careful consideration. At Keble’s Trading we can help you select the right product for your needs. Our experienced technicians will understand your project and guide you to select the right chain sling and associated equipment. It is important that you understand your requirements and assess your operations in line with the working load limit charts. Checking your loads, angle factors, and operating environment is crucial so that you select the correct size, number of legs and components to suit your intended application. All products we sell are tested and tagged and come with a certificate of compliance for your comfort. Turn to Keble’s Trading for reliable-grade CHAIN SLINGS. Talk to us! We speak your language! We understand your business. Call us at 1-800-067-687 or fill out the contact us form below. No inquiry is too large or too small. We would love to be of service to you today!